Each set comes with 8 best matching bags(4 of each color) and ready to play out of the box. No assembly required. You may request different color bags during the checkout process. 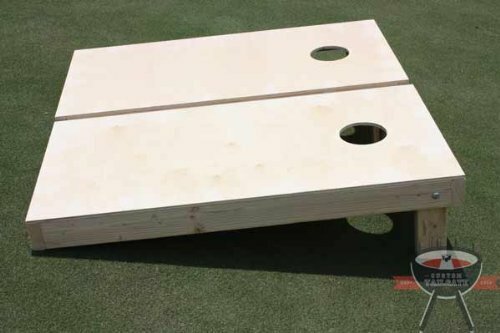 Our boards are made with the highest quality materials and craftsmanship. . We're not like other companies who advertise "mid western craftsmanship" and then import cheap Chinese boards. Our boards are built in the U.S.A with pride and attention to detail. The bags that are included in the set are also handmade in our shop from duck cloth and each bag weighs between 15-16OZ What are our boards made from? -Half inch premium plywood for the top -Premium 2x4s - higher quality than standard 2x4's -Painted with official licensed team color paints -Sealed with a high gloss sealant to help protect the paint finish Our boards are built to ACA regulation standards. What does this mean? -Board length 48 inches. -Board width 24 inches. -Hole is 6 inches in diameter If you don't see something you like and have a special request feel free to contact us! We love a challenge! If you have any questions about this product by All American Tailgate, contact us by completing and submitting the form below. If you are looking for a specif part number, please include it with your message.